my husband casually mentioned he was thinking of making a special pasta dinner that night. But instantly, I started to feel queasy. A pasta with olive oil? With my new white marble counters? I held my breath as I imagined olive oil stains and marinara sauce splatters. Then I started to sweat and felt that feeling starting to rise up a little bit. before someone else touches it and damages it. put down the marinara sauce & step away from the kitchen? they do get used as most of us actually do cook in them. So why did I choose marble knowing that my husband would cook with olive oil and red sauce? and that I wouldn't know until the morning when I got up. and that red wine might drip on it? and rub it in and just get on with the inevitable right now. We did not of course. But, he had a point. If you are going to have marble- you are going to get that patina. C'est la vie. or just get over it and relax and enjoy them. First of all- I love patina- and I don't consider it a bad thing. I like pristine- but patina shows me that something was important to someone. It is kind of like the Velveteen Rabbit when his fur was worn away from years of love. but I am going to embrace those imperfections when they come. Marble has been used for centuries as flooring, on counters, in bathrooms, etc. It shows years of wear and tear and is even more beautiful because of it. To me, it is timeless and a perfect choice. 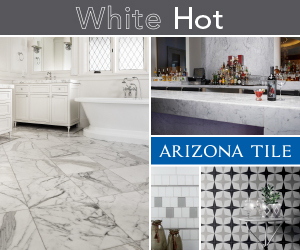 When I first started working with Arizona Tile, oh believe me, I already knew what I wanted. I walked in and said I wanted a pretty, highly polished white marble. Let's just say that the pretty polished marble train stopped right there. what the best option for our kitchen would be. that I thought I would try to answer some of them first. and some of what I have learned since delving into the world of marble counters. I love polished marble- will it work in a kitchen? Are your counters polished or honed? Me too... and yes and no. You can put polished marble in but know that it will etch- and when it does it won't be pretty. Think about a water stain on a tabletop- you know how it clouds up? That is what happens when marble etches. It's not shiny in that spot. It looks dull. So what is the alternative and what did we choose? 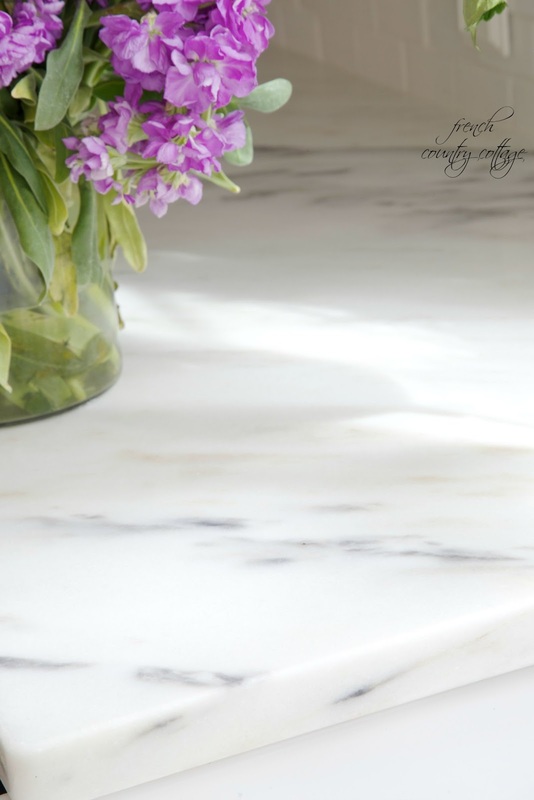 A honed marble is smooth and pretty- and just one step below polished. It isn't shiny though, it is a matte finish. I knew that Steve was right. Is all marble the same as far as durability? Originally, I was thinking pretty white marble with grey veining. to see what they had was their incredible pricing. They had a huge selection of carrara slabs for less than HALF of what the remnant slab shops were selling them for. I was amazed- and that was their everyday pricing. Seriously- no joke. and I was really looking for a white background. and one of them was the Vermont Imperial Danby Honed. when dealing with stains and absorbing things like oils. I didn't know that at the time, but am certainly glad that they did and pointed us in that direction. if you want the look without the worry. Did you seal the counters? How do I do that? How many coats? I Sealed it. And sealed it. And sealed it. It is not difficult to seal marble but it makes a world of difference in how that marble is going to look. I used 3 coats of Dupont Sealer (Lowe's) for our marble. it is so simple to do- you paint it on and let it dry. every 6 months to 1 year. You will be less stressed knowing it is sealed. Did you install the slab yourself? but cutting and installing a slab ourselves was a big no go. When you decide to go with a slab of stone- whether it is marble or granite or quartz or whatever- you will need to have it fabricated- or cut to the pretty much exact dimensions of your counters. That can cost as much as some of the materials out there depending on the edging detail you choose and size so you need to factor that in. To install slab correctly, it is not a DIY job. and having something chip or crack? getting the seams glued together with no difference in height, etc. and set it down without breaking anything. that it wasn't his job to do that. How has it been holding up so far? and coffee drips... Seriously. COFFEE worries me. But so far, the sealer has repelled stains and any coffee or wine drips. That said, I take precautions. I set the coffee maker on top of a marble pastry board on the counter- just in case it leaks or has an issue and I also do wipe the counters down several extra times a day. and partly to ensure that there isn't something there that might sit long enough to soak in. 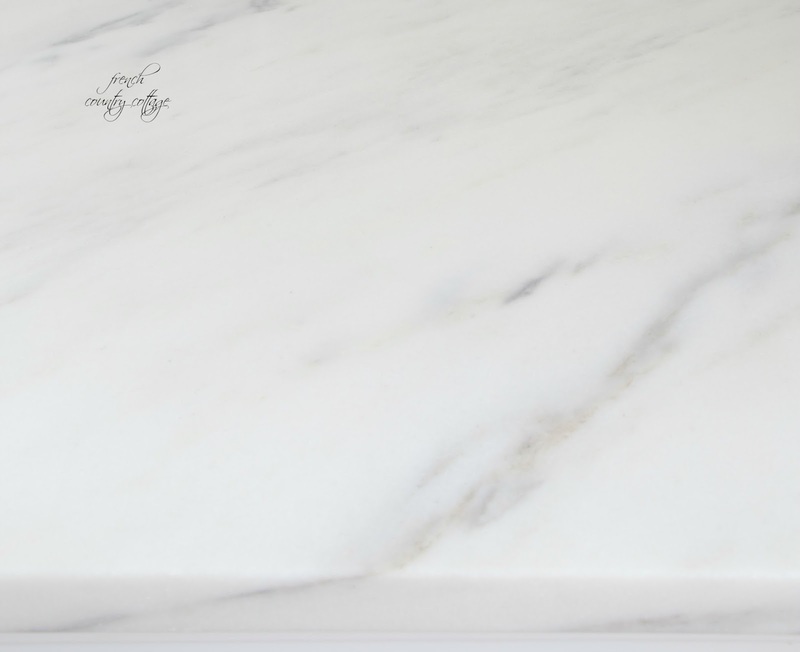 So overall, if you love marble and want it in your kitchen- I say go for it. overwhelming marble stain anxiety at first. And maybe even let your family use the kitchen on occasion. wiping up everything that you think they might have spilled. and I will do my best to answer them in the next post. Oh the joys of renovating. for any tile or stone needs- their prices are great and their customer service is top notch. I am in LOVE with your marble too:-) That has always been my first choice, then I thought quartz might be a better choice for me but ended up with wood. I do have two large slabs of marble from an old store I use for cutting, and all I did was seal them. They get a lot of abuse, but still have a beautiful patina. I also have my coffee pot in a marble board any leaks will not hurt the wood underneath, lol. I'm sure you will love these forever...they are gorgeous!! 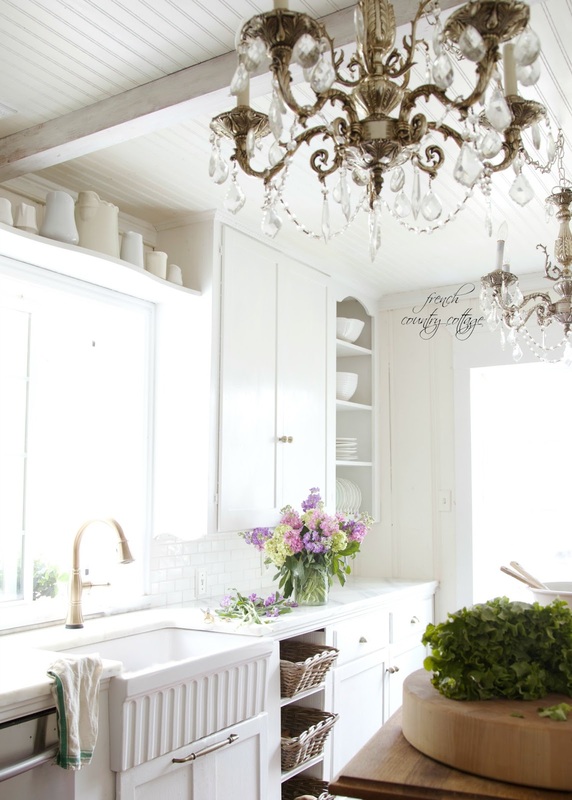 I love wood counters as well- they have such a beautiful charm! Those marble boards come in pretty handy! I thought it was a perfect solution too. Thanks for stopping by Anita!! You have such pretty kitchen... and home. I love your style and love to come here and be inspired. Your kitchen is gorgeous Courtney! Love the marble you chose. We had Mountain Danby marble at our last home and LOVED it! The only staining we had was from oils - wine, sauce, etc always wiped clean! I would do it again in a heartbeat. It's gorgeous, Courtney! Haha. I like your husband's solution. . .just get it over with. Seriously, your kitchen is fabulous. 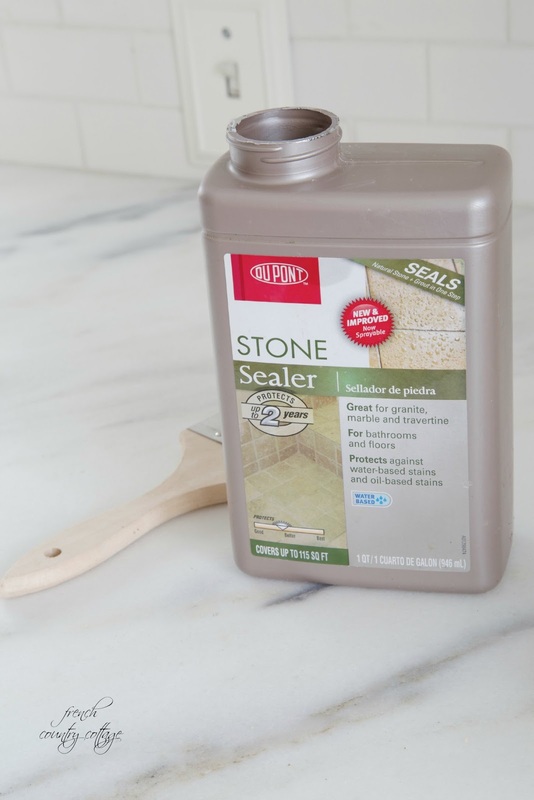 There are so many tricks of the trade to cleaning marble, I had them in my last home that I sold a few years before I was blogging, and I embraced the marble so much so that I purchased well seasoned salvaged marbles, white of course... 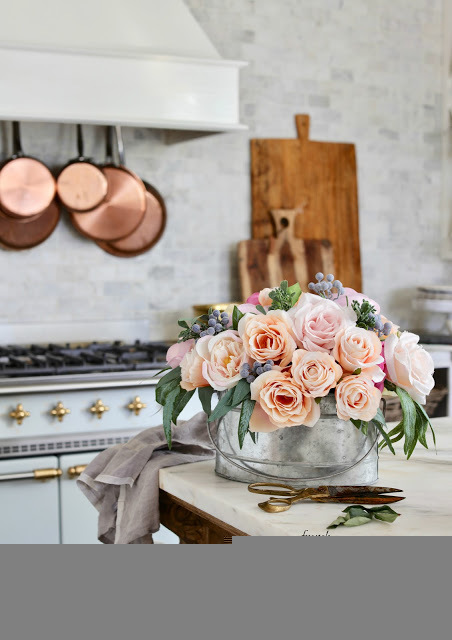 I wanted the feeling in my kitchen that it had been there 100 years like my Grand parents home, and all the movies that they had filmed in there home, made me want them well seasoned. Being raised in a movie art producers life you learn tricks of the trade to all sorts of paint and removals and cleaning materials, and I did not care if my marble was stained, scratched and beautifully abused. I wanted that old movie picture counter that felt like it was in a French bakery and that pastrie doughs were rolled and flowered daily. Nothing like well seasoned counters, adding all the history and charm of a heirloom cottage home. You will enjoy the beauty they offer in rolling out those doughs, and all the beauty of the mess dusted all over them. I was really thinking about doing it in this home, but it's small, and an investment home that was to be lived in by my daughter and I for a short time, time gets by and the economy is better making it perhaps a better move investment wise to do so. If we don't move soon to Santa Barbara perhaps we will upgrade the counters cabinets for the weight of marbles and see what will become of this move. Courtney enjoy those counters, there is nothing like waking up or going to bed at night with the last thing you've looked at is the beauty of marble counter tops. You have a kitchen to love. Hi Dore! Such a sweet note!! 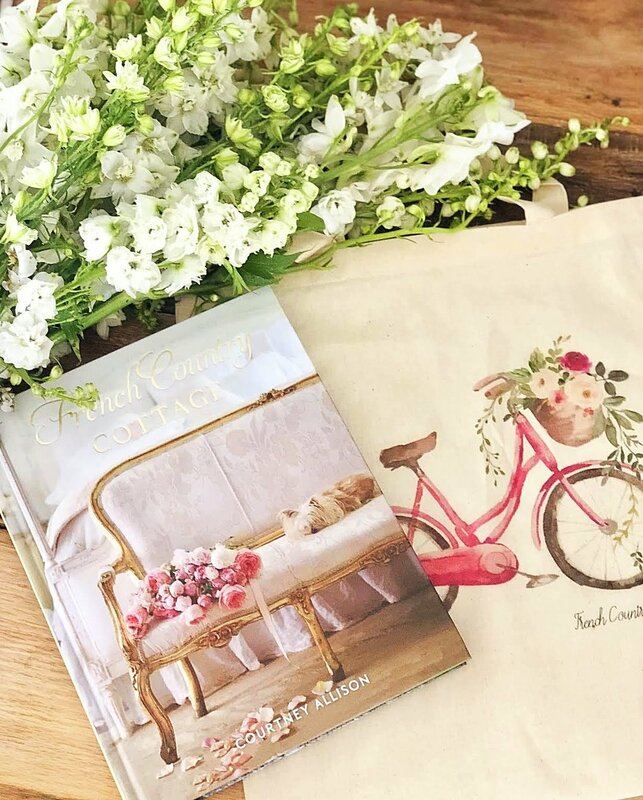 I enjoyed reading about your marble experiences and memories and I just love the way you described the look that those well loved pieces of marble have- so perfect. :) Thank you for stopping by!! I love your counter and am glad you love it also,it is important for us to care for everything we have no matter what but also to enjoy. 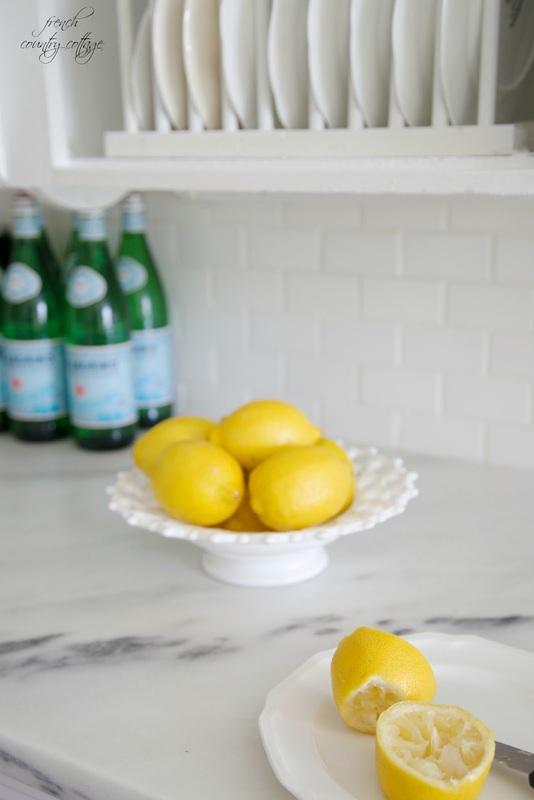 Courtney, I love your marble counters. Thank you for enlightening us about marble. Glad I could help Mary~ Thank you for for stopping by! Your counters are gorgeous and I love your philosophy!! !...Great information here...absorbed every word for the future! I have Carrera marble and wanted it to be honed. But my husband wanted it polished - ha, he doesn't clean at all. There are a few shadows on the marble now and I'm OK with the look because I wanted the old world charm appeal. So I'm somewhat getting a honed look. But I'm going to go back and read your instructions further for the annual maintenance. glad for this timely post. I am building a home and have debated back and forth ad-infinitum about marble. Have you dripped vinegar or mustard on those counters? I think mustard is my biggest fear....a huge YELLOW stain on that beautiful white. No haven't had any mustard or vinegar drips but I would think as long as you sealed them and made sure to wipe it up without waiting too long they would be okay. I bet it is absolutely beautiful Cheryl!! It is a gorgeous marble isn't it? Enjoy!! I've been considering marble and my mom was so worried about it's durability even though it's not her house lol. She read reviews about a couple of different sealers and now feels better about it. I wasn't worried. Last spring I walked the marble streets in Athens and remember thinking how pretty they looked despite age and exposure to the elements. Considering I'm not planning on walking on my marble or leaving it outside it should be okay! That is so funny Jennifer!! :) It does evoke a bit of that marble anxiety! I totally agree with you about the patina of older marble- it is beautiful :) Thank you for stopping by!! 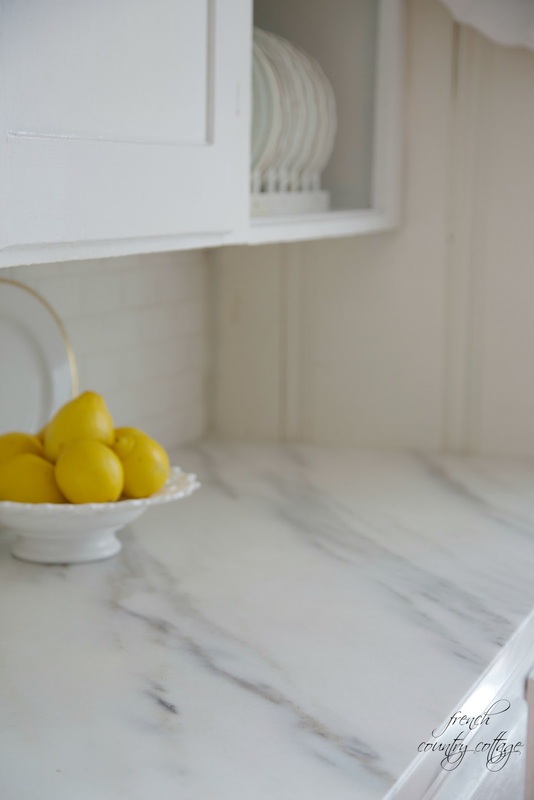 I love marble, but I opted for white quartz in my kitchen and bath counter top areas. Your kitchen has the clean airy look that I like. I enjoyed your pictures. Thank you! I have heard good things about quartz too- I bet your counters are beautiful! Courtney: Thank you, Thank you, Thank you for this wonderful information. The post came at just the perfect time as the representative from our local kitchen center came to our home this morning to discuss our kitchen. Wish you were here for guidance! Anyway, your information helped me considerably to discuss counters with her. I have an old wash stand that is most likely from the late 1800's with a marble top. It is just beautiful and has lots of patina to it. 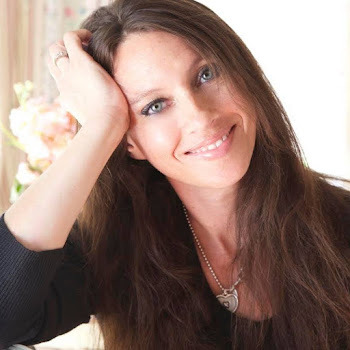 I so agree with you about the love, joy and memories that will come with time for your countertops and I do hope that one day in this country we can come to the same ideas and get away from such perfectionism. 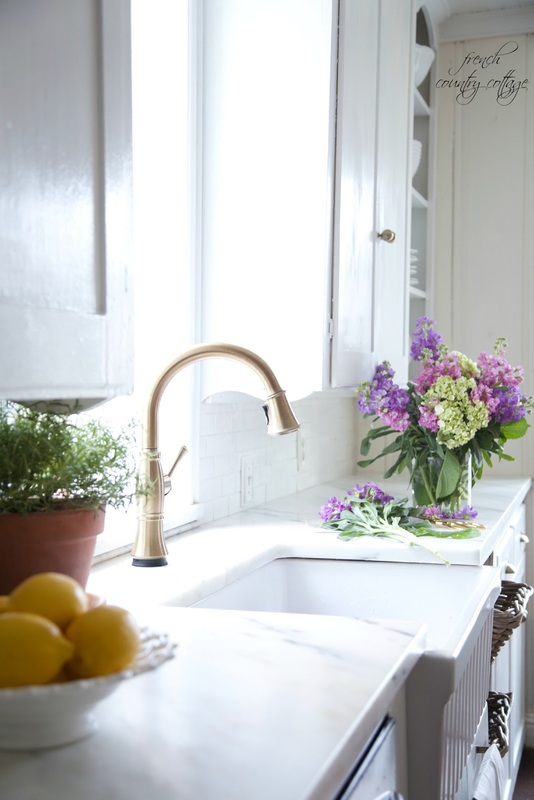 Your countertops are beautiful and timeless! Enjoy them everyday! You are most welcome Sandra- I'm glad that it helped with your counter choice! I agree with you about 'patina' and how we should look at more things in the same way. Thank you for stopping by! Oh! I've wanted marble counters for such a long time. They give the kitchen that classic look. And Courtney you've unintentionally answered a question I've had for a long time. 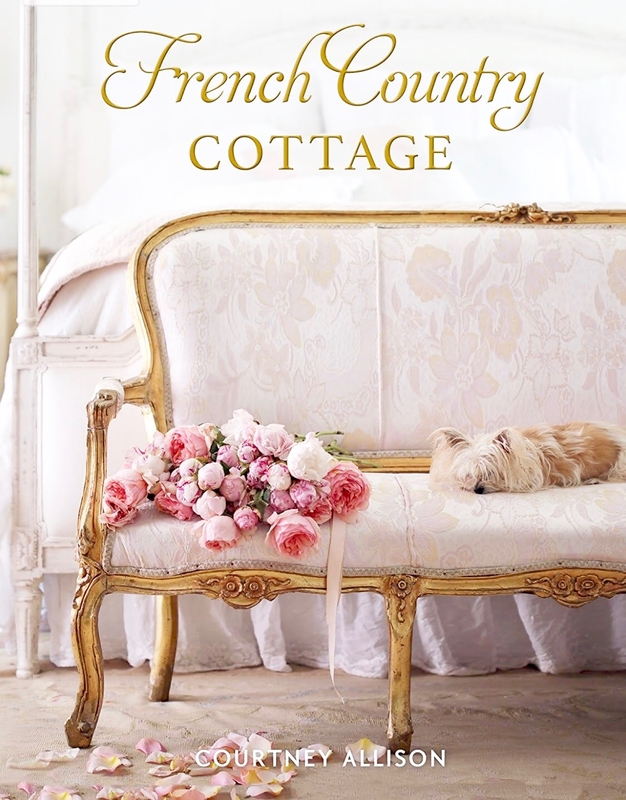 I know your love of things French -- I couldn't figure out why you had an Italian saying in your dining area. You just mentioned your husband is Italian. Ecco! You answered the question. Your kitchen is absolutely beautiful and a kitchen is meant to be lived in -- your choice is perfect! Thank you for this article. Perfect timing! Our Vermont Danby will be installed in a month or so. I've been reading up on ways to care for it. You mentioned wiping the counters several times a day. Is there a specific brand or type of cleaner that you use daily? Nothing fancy- just a regular kitchen towel or sponge. Thanks! Do you use some sort of daily cleaner when you wipe them down or just water? I love your counters!! I just left the stoneyard after staring at Vermont Danby and they gave me a copy of your article. I am still concerned about etching because I have a Crema marfil polished counter in my bathroom that is badly ercged. has etching been obvious on your homes counter or concern for yo? Hi Martha! How funny!! The Vermont Danby is gorgeous! I have not had a problem with etching on my counters. As I mentioned in my post though, I would definitely use a good sealer several times and just make sure not leave any oils or anything on them. Hope that helps! Thank you for stopping by and enjoy! Thank you for sharing this! 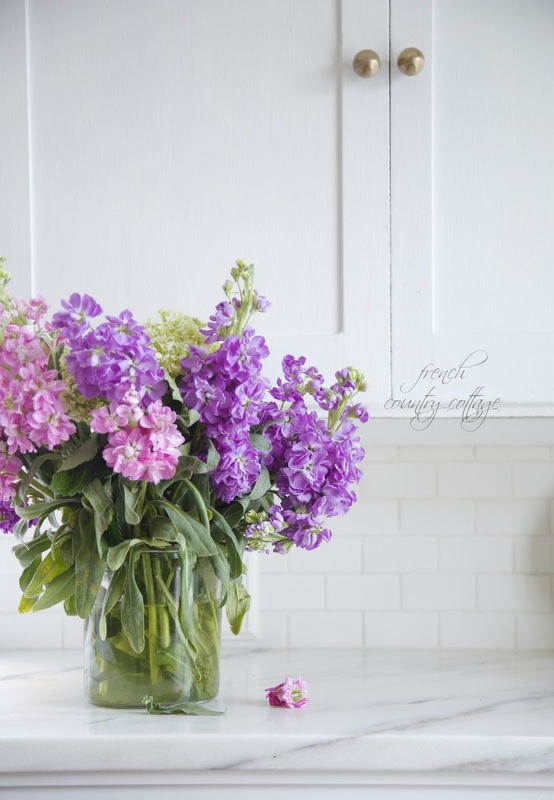 Your kitchen is beautiful, airy and timeless. I have been stressing over marble in my kitchen despite it being what I love. I have been looking at the Vermont marble as well at Arizona Tile only it is described as a 'satin' finish rather than 'honed'. When I feel the honed Carrara marbles they are much smoother than the satin Danby marbles. Is your honed Danby very smooth? Did your fabricator do anything after purchasing to the finish? Thank you in advance and sharing your photos! Hi there! Thank you for your compliments! Our marble is a smooth marble to the touch- but not in a polished type of a way. I would say that it is probably more of a satin type finish- that seems accurate. It is beautiful in person - I don't think you could wrong with either- and Arizona Tile is great! They helped me so much when I was choosing the type of marble to use. The fabricator didn't do anything else to the counters after he finished. The only thing we have done is seal them with a marble sealer. Hope that helps! 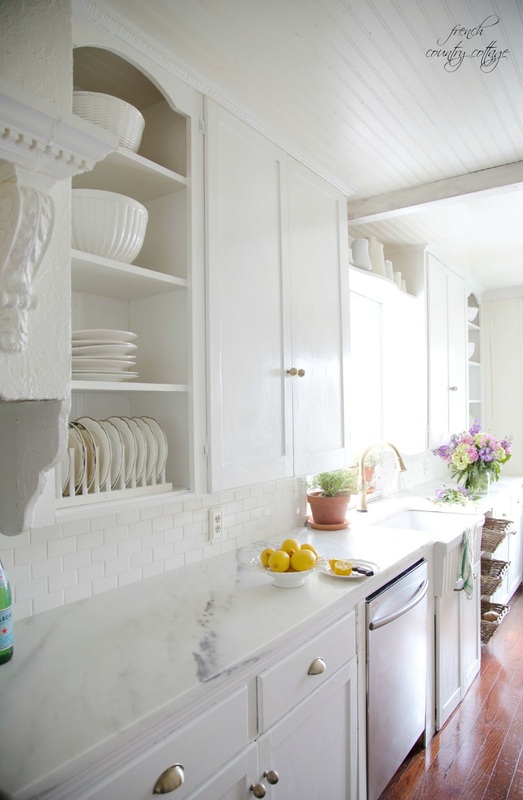 I so love my honed carrara marble on my kitchen island. It was installed 4 yrs. ago during our home remodel. Everyone and anyone thought I was nuts. I dreamed about this island for decades...and refused to let anyone talk me out of it. I do not have one regret about my decision. I did, however, decide to use white quartz on the perimeter counters to give me some leeway with food prep. (Yes, yes....I was just a little nervous, lol!) I loved the marble so much I decided on polished carrara for my bathroom vanities with small hexagonal carrara tiles on the floor. Yes...there are indeed water stains but I expected them so they don't bother me at all. (Heck..I put those same carrara hexagonal tiles on my shower floor and believe me...they get wet ;) ) Your kitchen is amazing...I also glad you are enjoying it! Hi Courtney! We are getting ready to begin our kitchen renovation and we thought we were going to use a quartz countertop; however, I am very interested in Imperial Danby. You have given terrific information about etching and staining, but I am interested in knowing what edge style you chose? I like the eased edge, but I have read in order to prevent chipping, a 3/8" roundover is best. Have you had any issues with chipping? Thank you! Courtney, what edge style did you choose for your countertop and have you had any problems with chipping? Thank you!